Audio-Technica sports True Wireless ATH-SPORT7TW brings you right into the heart of the music. Singapore, 19 November 2018 – Audio-Technica’s sports True Wireless headphone model, the ATH-SPORT7TW is designed for those seeking complete freedom from wires when pursuing an active lifestyle or listening on-the-go. Combining the company’s renowned audio quality with an ergonomic and ultra-comfortable design, this True Wireless headphone allows you to focus on the music and the day ahead without any distractions or constraints. Arriving in a choice of stylish black and gray finishes, this sports True Wireless model allows you to focus on your fitness regime while delivering the soundtrack to fuel your work out. Compact and discreet, its snug in-ear fit is aided by ergonomically-designed Freebit® earfins for maximum stability and comfort during intense sessions. Certified with an IPX5 rating, this sweat and weather resistant in-ear headphone can even be rinsed under a tap after vigorous workouts. 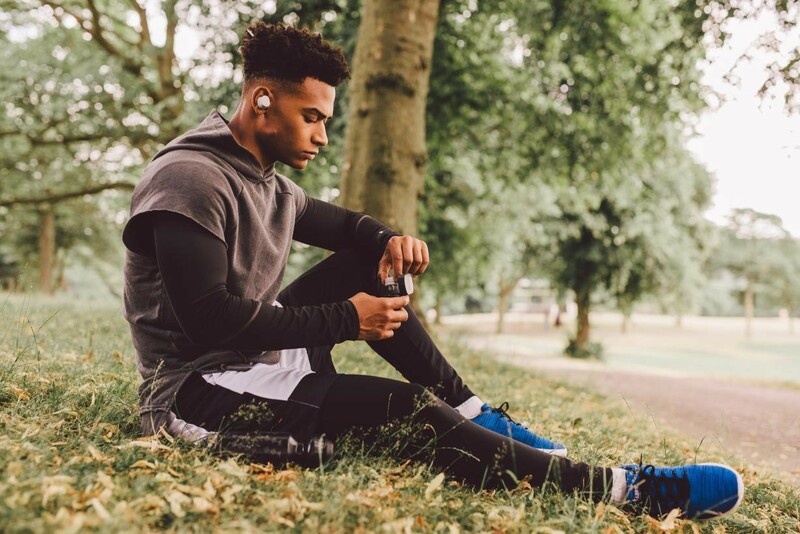 When the ATH-SPORT7TW accompanies you on your daily run outdoors or a trip to the busy gym, a switchable ambient noise hear-through function improves awareness and safety. Tap and hold for seconds on the left housing to enable you to hear the sounds and world around you. Touch controls enable easy and quick management of calls and music during exercise, while these functions can also be amended from your smartphone using the Audio-Technica CONNECT App for iOS and Android. The ATH-SPORT7TW provides 3.5 hours of music on a single charge – more than enough for your fitness session, while the compact charging carry case boasts a further 14 hours of charge if you need to re-juice while on-the-go. If the battery is low just before a workout, a handy quick charge function will give you 45 minutes of music from a 10-minute charge. Image above: Audio-Technica sports True Wireless ATH-SPORT7TW compact charging case. The ATH-SPORT7TW provides a powerful audio to match the workout intensity, with specially developed and designed 5.8mm dynamic drivers delivering the sonics. Elsewhere the headphones support the latest Bluetooth 5.0 wireless technology plus AAC and SBC audio streaming codecs. Along with a USB charging cable, silicon ear-tips (XS/S/M/L), Freebit® earfins (XS/S/M/L), a medium-sized sweat proof, soft memory foam Comply sport ear tip is also supplied. The Audio-Technica’s new ATH-SPORT7TW Black and Grey are now available for purchase at MSRP S$298.